The following email contacts are used in our CDN dashboard. You can view and edit them on the Billing/Settings page. It is used as username for login to our CDN dashboard. It is used as default username for login to our Helpdesk Dashboard. It receives all email notifications. It is an ID of your account in our system. 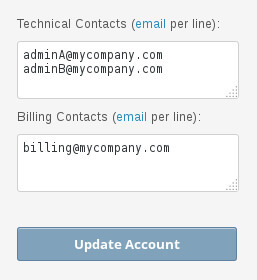 It is a list of email contacts that you want to receive technical notifications, e.g. a confirmation that a new CDN service has been created. It is a list of email contacts that you want to receive notifications regarding money and payments, e.g. your credit balance updates. It is an address detail of your company. It is not used for notifications. It is a backup contact for two factor authentication and it is an address detail of your company. It is not used for notifications.